touristplacesinindia offers complete information on the city of Rishikesh, Temples in Rishikesh, Rishikesh tourism, Hotels in Rishikesh, Rishikesh Tour Packages, Tour to Rishikesh, Travel Packages for Rishikesh, Tourism in Rishikesh, Rishikesh tour. Nestled picturesquely in the foothills of the mighty Himalayas, Rishikesh is an important pilgrim destination of north India and is also popular as the �world capital of yoga�. This spiritual town has gained immense significance and occupies a permanent position in the itinerary of a globe trotter who is on his north India tour. It is the point from where the journey to the char dhams (four sacred spots) commences. This place is also an irresistible lure for the adventure seekers as it offers a number of adventure options such as trekking expeditions to the snow capped Himalayan peaks and water rafting. travel to Rishikesh for an amazing experience involving religion, adventure, culture and ancient Yoga practices. 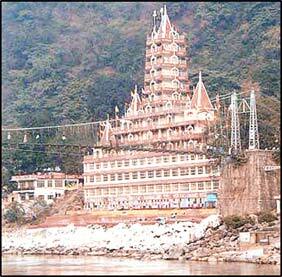 Rishikesh is also an important gateway to the Himalayan shrines of Badrinath, Kedarnath, Gangotri and Yamunotri. Besides, the various yoga centers located here have elevated this town to a leading position among the tourist destinations of north India. Apart from the breathtaking natural beauty, you can take delight in a number of other highlights that are located here such as Bharat Mandir, Rishikund, Triveni Ghat, Geeta Bhawan, Lakshman Jhula, Swarga Ashram and Trayambakeshwar Temple. All these tourist attractions in Rishikesh are highly recommended during a tour to this holy place. The search for the spiritual ends at this place as it is dotted with numerous spiritual centers that give valuable tips for a healthy living and purification of mind and soul. Finding a good accommodation in Rishikesh will not be of much hassle provided you get booked in advance. Rishikesh is strewn with a number of hotels and resorts that offer excellent guest facilities and amenities essential for a contented stay. One of the leading three star hotels is Ananda in the Himalayas offering you the comfort and luxury of the modern days. Another hotel that you can put up in is �The Glasshouse� on the Ganges, which is highly acclaimed for its services and facilities. Several resorts are also located here. Rishikesh, being a center of religious importance has excellent network of transportation and you can reach here from the distant towns of India. The nearest airport is Jolly Grant in Dehradun and the carriers for the other destinations of India operate from here including New Delhi. You have to come down to Haridwar in order to reach Rishikesh from where other rail connections are also available. Rishikesh is well-linked by road with the capital city Delhi and which is further connected by the national highways to other destinations of India. Find more information about Rishikesh by browsing through the site touristplacesinindia.com, which offers valuable travel information on Rishikesh.